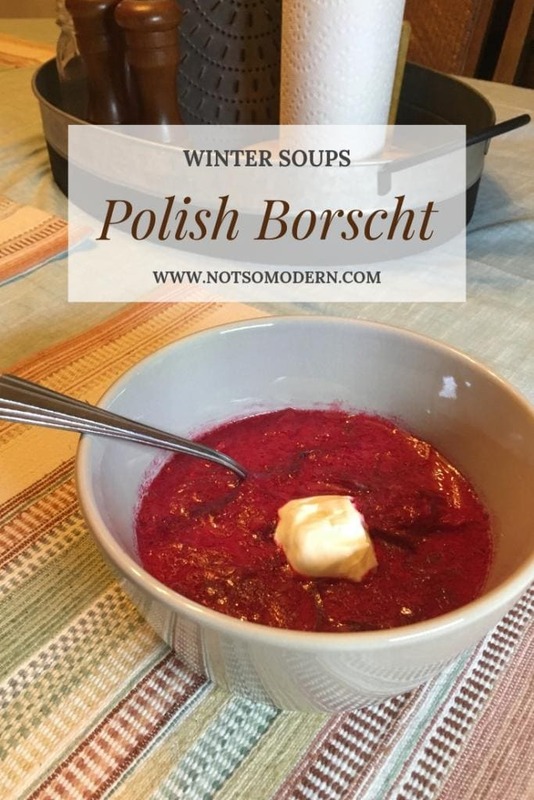 Polish borscht is a popular winter soup when beets are in season, and hot soup can bring comfort and warmth. While the main ingredients are pork and beets, its flavor is very similar to chicken noodle soup. The milk and sour cream in this recipe to make it a little creamy. It’s still a very brothy soup and surprisingly doesn’t have a lot of beet flavor considering how much is in it. 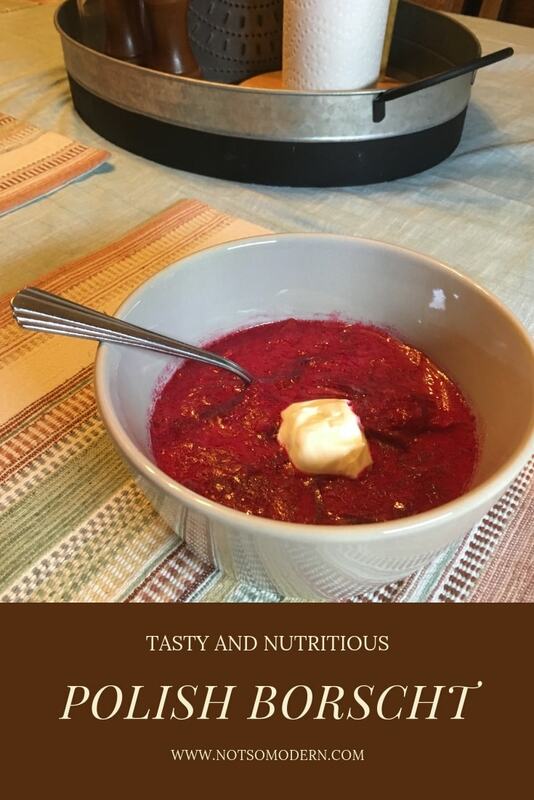 The borscht definitely gets most of its flavor from the pork. It can be served alone as a soup or with boiled potatoes and rye bread. This recipe makes a lot, so serve it at a big family dinner or plan on eating borscht the rest of the week. In a large stock pot, combine spareribs, onion, bay leaves, peppercorns and vinegar. The vinegar will aid in drawing minerals and collagen from the bones of the ribs, making this a very nutritious and beneficial soup. Cover the ribs with water and bring to a boil. Reduce the heat, and simmer until the meat is tender and bones pull out easily, 2-3 hours. The ribs need to remain covered with water while they cook, so you will need to add water as the broth cooks down. Towards the end of the cooking time for the spareribs, cover the beets with cold water in a medium pot and bring to a boil. Do not peal or cut the beets before cooking. Boil them whole. 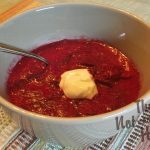 Beets will bleed their color into the water if they are cut or peeled before cooking, leaving less of that beautiful red color for the borscht. 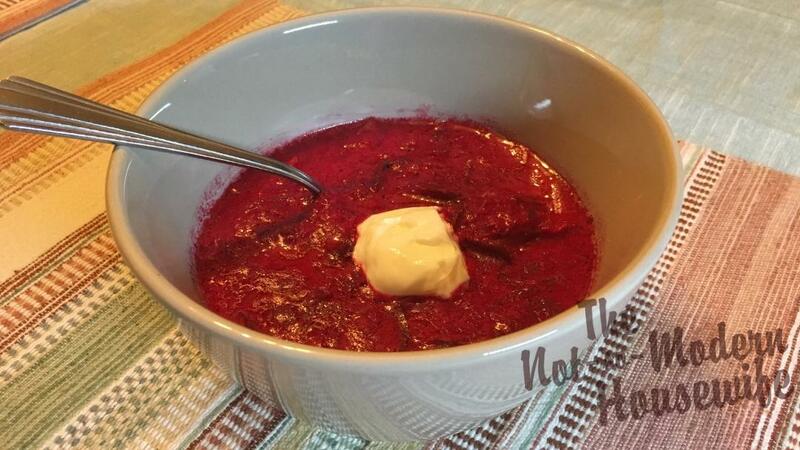 Simmer the beets for one hour or until the beets are tender (less time for smaller beets). You should be able to easily slide a fork into the largest beet. Drain the beets and let cool. Once cool, peel and grate the beets. Beets will turn everything purple, so you may want to wear gloves and an apron. I have found that it’s best to peel the beets, then use a food processor to grate them. When the meat is tender, remove the bones and meat from the broth. Strip off the meat into bite sized pieces. Return the meat to the broth and stir in the grated beets. Season the soup with salt and pepper. In a large bowl, stir together the sour cream, milk and flour. Gradually stir 2-4 cups of hot broth into the sour cream mixture. This works best if you can whisk the cream mixture with one hand while slowly ladling the hot broth into the bowl of cream. The goal is to take the chill off of the cream mixture so it doesn’t curdle when introduced to the hot soup. Slowly stir the cream mixture back into the soup. Heat the soup over medium heat at a gentle simmer. Do not allow the soup to boil because it will cause the sour cream to curdle. Serve warm.